James Taylor and His All Star Band & Bonnie Raitt comes to Fiddlers Green Amphitheatre on Sunday 27th May 2018! What an incredible line-up this Spring, two of the most iconic singer songwriters of all time have realised that they work so well together that they are hitting the road to showcase all of your favorite songs on the live stage. 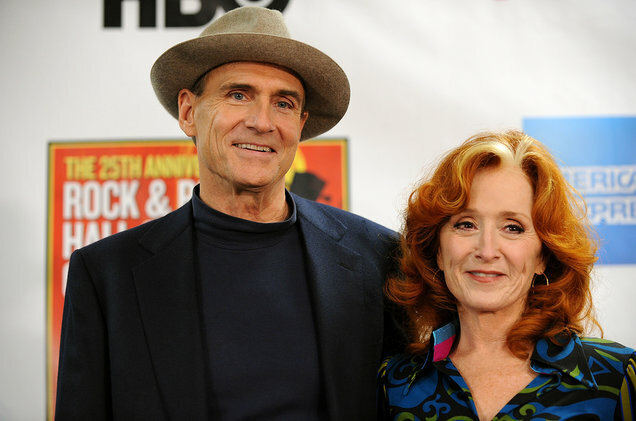 The sensational Folk guitarist and singer, James Taylor and the powerful vocals from Bonnie Raitt will be filling the amphitheatre and gracing the crowd with their moving melodies. Something rare happens when a beautiful song is created and this is a triumph that both Bonnie Raitt and James Taylor have well and truly accomplished, as being titled as two of the greats in the history of music, they deserve it with countless heart warming classic songs under their belts. James Taylor of course first came to light during the biggest Folk era of all time, in the 1970's. In America during this decade, some of the most prolific songwriters to ever walk the earth were first producing albums and changing life as we knew it. James Taylor was most definitely one of them. Taylor achieved his incredible status that has survived to this day, in 1970 with the No. 3 single "Fire and Rain" and had his first No. 1 hit the following year with "You've Got a Friend" – of course a cover version of the Carole King's classic song. Many who do not know the original too well, really can't believe that this is not his own song as he sung it with such authenticity and warmth. James Taylor's Greatest Hits album was certified Diamond and has sold 12 million US copies. As a celebrated musician throughout the years, it's a wonderful thing to see that Taylor has remained one of the most humble and appreciative people in the music business.